Move. Your body needs some short exercise to produce adrenaline and remain alerted. A light cardio, such as a 10-minute jog or at least some stretching, is what you need. But don’t overdo to save your energy. Think blue. Look at the sky. Scientific fact: you can reduce melatonin production, looking at the blue color. Listen to the music. It will help release neurotransmitters to increase your alertness and focus. Hydrate and caffeinate. The combination of coffee and water will help you feel more awake for a longer time. Scrub down your entire body. It will reenergize your body and rejuvenate your skin. Finish your shower with cool water and apply a moisturizer afterwards. Play contrast. Soak your towel in hot water and leave it on your face for 10 minutes. Then splash your face with cold water about 15 times. This simple procedure will make your skin glowing. Also, moisturize your face skin more heavily after a sleepless night. Help your eyes. 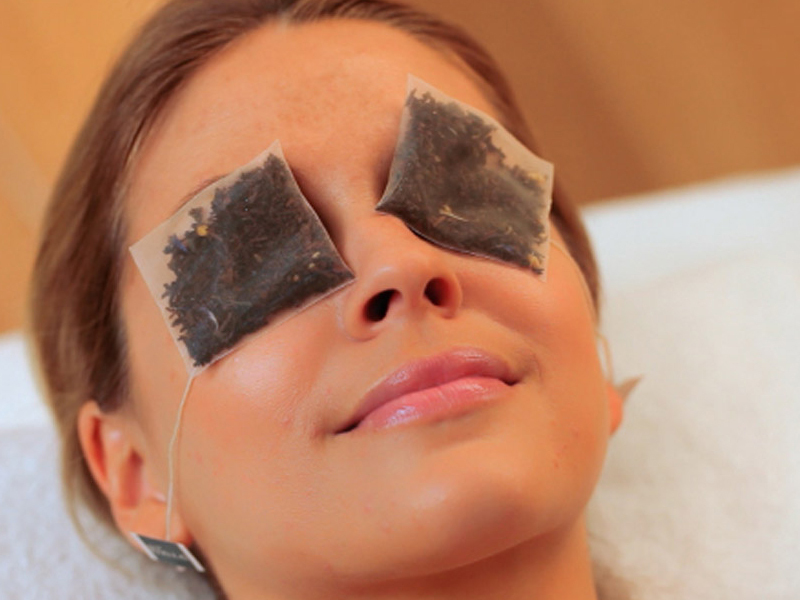 Soak two bags of green tea in cool water and put them onto your eyes for 5 minutes. Use eye drops if your eyes are red or itchy. Keep your makeup basic. Your skin needs to breathe as much as possible, so use only a minimal amount of makeup. To brighten your skin tone, you may apply some bronzer to the apples of your cheeks. Bad oily hair? Just make a simple bun or ponytail. Dress well. Wear something bright, choosing vivid colors, such as red, yellow, or orange to improve your mood. Remember that your clothes should be simple, well-fitted, and neat. Now you know how to look better and what to do after a sleepless night. Apply these tricks so that no one will notice your lack of a night rest.